Red. / 13. Nov 2017 - Das Desaster war voraussehbar, sagt Syrien-Kenner Nikolaos van Dam. Sein neues Buch heisst «Destroying a Nation». Red. Die Vorbedingung eines «Regime Change» in Syrien habe Verhandlungen verunmöglicht. Militärisch sei ein Erfolg aussichtslos gewesen, weil die USA, Saudi-Arabien, Katar, die Türkei, Irak, Russland und der Iran alle ihre eigenen, unterschiedlichen Ziele verfolgten. Im Folgenden eine sehr interessante Analyse von Nikolaos van Dam. Er war Hollands Botschafter u.a. in Irak und Ägypten und veröffentlichte soeben sein zweites Buch über Syrien*. Syria: Who will win the future? We all know that the situation in Syria has become a disaster. And one can ask oneself whether this disaster could have been foreseen and prevented. I personally am convinced that the main developments in Syria could have been foreseen, certainly as far as the behavior (and misbehavior) of the Syrian regime were concerned. For many observers, however, all the cruelties at first went beyond their imagination; even though they could have been predicted – and were predicted – by some people having a deeper knowledge of the Syrian regime. There were some essential elements, however, that could not have been clearly foreseen. One of these was the so-called «Arab Spring» that brought many Syrians in a kind of euphoric mood, after political leaders in Tunisia, Egypt and Libya resigned or were toppled with the help of Western and Arab countries that proclaimed that they wanted to support or protect the Arab populations against their dictators or authoritarian rulers. The peaceful Syrian demonstrators imagined at the time that they would be fully supported by the Western and Arab countries that had proclaimed that they wanted to help them. In the end, however, it turned out that this help was not only insufficient to achieve regime change, but it also contributed to a prolongation of the war with all its destruction and death. Another element that was not foreseeable at the beginning of the Revolution was that the Syrian military opposition groups were going to receive substantial military aid from foreign countries like the United States, Turkey, Saudi Arabia, Qatar and others, enough to start a combination of a civil war and a war-by-proxy, but not enough to bring about the regime change they wanted. In fact, the war was initiated (in reaction to the atrocities of the regime) without, however, sufficient means and planning that this war against the regime could also really be won. Before engaging in the war, the interfering foreign countries should have sufficiently studied the military situation in order to be sure that their Syrian allies had a realistic chance of winning it; but they apparently did not. The half-hearted military interventions of various foreign countries in Syria have in fact contributed to disaster. Most of the interfering countries (like Saudi Arabia, Qatar, Turkey, the United States, Iran, Russia and others) all had their own strategic interests and motives. These were not necessarily coinciding with the interests of the Syrian people; certainly not if one looks at the disastrous results. Therefore, the question seems justified whether or not the so-called «Friends of Syria» in the end really turned out to be «Friends of the Syrian People». Those who supported the opposition groups, generally claimed that they wanted a political solution, but this solution in reality was intended to be regime change, if not peacefully – which was not going to happen anyhow – then with military force. But this did not work either, because the option of direct foreign military intervention was written off in 2013. Russia and Iran intervened militarily because they wanted to safeguard the Syrian regime as an important strategic regional ally. For Saudi Arabia and Qatar, it was important to remove Syria from the Iranian power orbit. And I have few illusions that it was the priority of Saudi Arabia and Qatar to military impose a political system on Syria that they did not have themselves: notably a secular pluralistic democracy. The United States, who were never friends of the Syrian Ba’thist regimes, wanted the same as Saudi Arabia and Qatar, as far as Iran was concerned, but they also welcomed a weakening of Syria to the advantage of Israel. And Turkey wanted a like-minded Islamic regime in Damascus. None of these foreign countries has achieved what they wanted, neither did the Syrian opposition. Many politicians may have sincerely wanted to help the Syrian population against its oppressive regime, but for the bigger countries strategic interests were at least as important as humanitarian considerations. It should have been clear from the very beginning in 2011 that the regime of Bashar al-Asad was not going to voluntarily give up its power position and resign. Thinking that al-Asad would step down or aside, as demanded by many Western and Arab political leaders, as well as by the Syrian opposition, may have been well intended and justified from their points of view, but it obviously was not going to happen. Which Syrian dictator has ever given up his position voluntarily, to be imprisoned or executed afterwards? None, of course. The Syrian War was bound to happen, because Syria had been dominated for more than forty years under presidents Hafiz al-Asad and his son Bashar al-Asad, who managed to stay in power with the support of one all-powerful military faction with a highly reliable and effective security apparatus (also effective in the sense of severe repression). This resulted in a period of internal political stability and continuity, longer than ever before since independence. This continuity, however, was also linked to the absence of any substantial political reform or change in the composition of the ruling military elite, which implied the serious future possibility of strong discontinuity and disruption of the regime, once its long-serving political and military leaders would be endangered or would disappear. This so-called stability of the Asad regime, came to an abrupt end with the start of the Syrian Revolution in March 2011. More than 20 years ago, I predicted (in my book The Struggle for Power in Syria)** – and it was not that difficult to predict – that any scenario leading to the overthrow of the Alawi-dominated power elite, would inevitably be extremely violent. After all, the regime had never tolerated any real opposition, let alone alternative military factions that might threaten its position. Serious opponents were generally put in prison, severely tortured or killed. It was all about maintaining regime power and interests, with the most repressive means. Whereas the common sectarian, regional and family or tribal backgrounds of the Ba’thist rulers had been key to the durability and strength of their regime, the predominantly Alawi sectarian background of many of them was also one of its main weaknesses. This is because the «Alawi factor» (or the Alawi Gordian knot) is hindering a peaceful transformation from Syrian dictatorship towards a more widely representative regime. During its rule, the Syrian Ba’th regime became the antithesis of its own ideals. The Ba’thists had wanted to do away with primordial loyalties like sectarianism, regionalism and tribalism, which, according to their ideology, were considered as despicable residues or illnesses of traditional society. But in practice, the ruling Ba’thists achieved exactly the opposite, because their sectarian-tinted behaviour strengthened in particular the factors which they claimed to abhor. Their ideals in the sphere of socialism and social equality could not be fulfilled either, because of the fact that their regime was infested with corruption, clientelism and favouritism. And their ideal of Arab unity could not be realized, because there was not any Arab leader who was prepared to share his powers with others. And last but not least: instead of being a Ba’th Party rule, the Syrian regime has become a kind of dynastic rule of the al-Asad family. Nevertheless, and irrespective of the basic characteristics of the regime which should have been well-known, many Western and Arab politicians wanted President Bashar al-Asad and his regime to voluntarily step down, certainly after enough «naming and shaming» and «moral pressure» had been exercised by the numerous countries condemning him for all the atrocities the regime had committed when violently suppressing any opposition, including the large-scale demonstrations that took place all over Syria, many of them being peaceful. 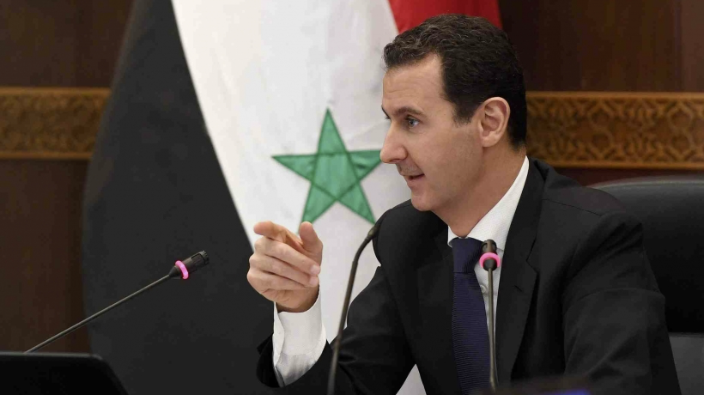 But Bashar al-Asad stayed and refused to resign – as could have been predicted as well, if only because dictators generally do not follow the rules of democratic accountability. The Syrian opposition, just like many foreign countries, however, kept insisting that al-Asad should disappear as president, and that he could not play any role in the «transitional period» leading to a new regime, let alone in the future of Syria; and that he should be court-martialled, for instance before the International Criminal Court in The Hague. But Bashar al-Asad was in power in Syria, and therefore these demands rather constituted a guarantee that serious negotiations with the regime were not going to take place. The Syrian regime obviously was not prepared to negotiate its own departure and death sentence, and never has been. The regime and the opposition have completely different views of what a compromise should look like, and without any form of serious dialogue, a political compromise is impossible. This does not necessarily mean, however, that if such a dialogue would start after all, that it would also yield real and substantial results, if only because the regime considers the Syrian War a struggle for its own survival, or a struggle for life and death. Only by toppling the regime with military force, it might have been possible to effectuate regime change, but not any country has been able or willing to do so. Moreover, regime change by military force would not necessarily have meant that the situation would improve, taking the experiences in Iraq, Libya, Yemen and Afghanistan into account. After more than six-and-a-half years, real dialogue is still being rejected by both the regime and the opposition, and the ever-increasing number of dead, the endless destruction and the millions of refugees have only strengthened the rejectionist attitude towards one another. Yes, both sides do want dialogue, but only if the other party does more or less exactly what is demanded by the opposing side, or, for instance, by United Nations Security Council resolution 2254 (the contents of which the regime refuses to carry out). It is remarkable that the Syrian regime has not even made any serious effort to come to a compromise with the opposition that operates from within the country; and opposition members who have been active abroad and want to return into the so-called «lap of president al-Asad», have been refused entry into the country. The opposition, and bigger part of the so-called international community, have claimed time and again that they want a just solution, and therefore want the regime and its members to be made accountable for any crimes or war crimes committed. Taking this as a point of departure, they actually want to be sure beforehand that the negotiations will lead to the regime being court-martialled. In other words: they want to negotiate with the regime on condition that president al-Asad cannot play any role in Syria’s future, and, preferably, not either in the political transition that is supposed to lead to that future. For the Syrian regime, on the other hand, «political transition» is perceived as a dirty word, because it implies a kind of regime change through a political transition, in which the regime has to share political power with its adversaries, and run the risk of being toppled. If justice is to be done, it can only be done after a political solution has been reached, not before. One can safely say that if president Bashar al-Asad wins the war militarily – and it looks that way – this does not mean that he has also achieved a victory in the political sense. Because in fact, all Syrians are the great losers in this terrible war. The gigantic task of bringing Syria back to normal life in every sense, remains one of the weakest spots of the regime. Once this weak spot comes out more into the open, it should not be excluded that opposition against the regime will also grow from within. Various Western politicians imagine that they can lure the al-Asad regime into political concessions and reform, in exchange for funding parts of the reconstruction of Syria. This is unrealistic, because it is founded on the same false presumption that existed during the last six years, that al-Asad will voluntarily make political concessions; in this case in exchange for foreign funds. Withholding reconstruction funds may hit al-Asad in one of his weakest spots: the economy. But it will also hurt the Syrian population under his control; and that is something most Western countries don’t want. Undoubtedly, there are other countries, like China for instance, that want to jump into the reconstruction of Syria. Participating in the reconstruction of the parts of Syria under control of the regime, without contacts with the al-Asad regime is impossible. As a result of the War, there are many millions of traumatized and dissatisfied Syrians. Countless Syrians have lost family members, which has caused wounds that are going to stay, on all sides. Corruption, embezzlement, and local suppression have increased enormously as a result of the war economy. People who were supposed to be loyal to the regime, were not always loyal when it came to their personal and economic interests. To force those people, who have profited from the war economy, back into line, and to put the ghost of intensive social conflicts back into the bottle is extremely difficult, if not impossible without yet another settlement of accounts with those who are considered to be responsible for it. If Syria were a very rich country, it would perhaps be somewhat less difficult, but the fact that the social fabric of society and economic life are in ruins, makes it all the more difficult to restore so-called «normal life». Personally, I have for practical – and in my opinion also realistic – reasons been calling for dialogue with the al-Asad regime from the very beginning of the Syrian Revolution, because I saw this as a key element on the way to a solution. Most of the time, however, this position was rejected, because al-Asad was supposed to leave. But he did not of course. With several hundred deadly victims, six-and-a-half years ago, dialogue would have been less difficult than it is now with the death toll going in the direction of half a million people. Under the present circumstances, it should be expected that the regime will continue the war just as long as it has all Syrian territories under its control again. Whether or not this succeeds, also depends on the willingness of the foreign supporters of the military opposition to continue their aid, and whether, for instance, the United States would consider it worthwhile enough to risk a military confrontation with Russia over Syria. The territories under control of the opposition are among the few remaining bargaining chips, if foreign support is continued. It should not be excluded, however, that foreign willingness to support the military opposition against the regime is decreasing, particularly after Da’ish [ISIS] has been defeated. If you would ask me Who will win the future in Syria? my answer is that in the near future it will be the regime, because it is military the strongest. This does not mean, however, that the regime is bound to win the future of Syria in the longer term. There is always the possibility of a change of forces from within. And as long as there is no political solution, the possibility of a settling of accounts between enemies remains. Whatever the case, serious efforts should be continued to help achieve a political solution, even if one is not fully convinced that the outcome will be a success. That is why I have ended my new Syria book Destroying a Nation*, with the words: «Miracles only happen when one keeps believing in them». Source of this text: Symposium on «Syria: Who will win the future», organized by the Dutch Ministry of Foreign Affairs, with Hadi al-Bahra (Political Committee Member of the National Coalition of Syrian Revolution and Opposition Forces), Ibrahim Hamidi (Senior Diplomatic Editor of Al-Sharq al-Awsat) and Nikolaos van Dam (former Ambassador and Dutch Special Envoy for Syria) as speakers and Karin Wester as moderator. **«The Struggle of Power in Syria», 4th edition 2011, by Nikolaos van Dam. Das Desaster war voraussehbar, sagt Syrien-Kenner Nikolaos van Dam. 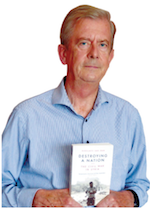 Sein neues Buch heisst «Destroying a Nation». 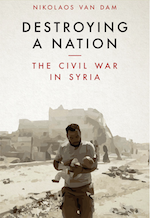 Unfortunately, this book does not reveal all facts about the war in Syria. Experts who have been following the situation in Syria since March 2011, know for sure that Turkey and Saudi Arabia supported, financed and trained the Jihadists (the Islamists) in Syria from the BEGINNING. The United States played a major role in training Jihadists and fundamendalist after 2011. According to Nikolaos Van Dam the US only trained the Free Syrian Aramy (FSA) between 2011 and 2016. The FSA did barely exist after 2012 when Jihadists groups proved to be the only effective military player on the ground. With all due respect to the writer's experience, it's so naive to try and hide these facts in his book. However, this is one of the very few books which admits, to a certain extent, the involvement of the West in this dirty war against the SRIAN PEOPLE first and foremost. Ich kann mich diesem Kommentar nur anschliessen. Die imperial/kolonialistischen Verhaltenspattern betreffen aber nicht nur die Heimatländer der «Seven Sisters» sondern auch die Kolonialinteressen Frankreichs. Von Interesse in diesem Zusammenhang mag sein, dass die kriegerischen Handlungen in Der'aa - einem regim-gegnerischen Schmugglerort angefangen haben. Der Einfluss von aussen, mit handfesten Interessen einzelner Gruppen ist unübersehbar. Die ganzen Zusammenhänge mit der Ölindustrie wurden ja im Infosperber schon mehrmals diskutiert. Was mich aber immer wieder etwas wundert, ist der Begriff der «syrischen Nation». Das aktuell immer noch unter dem Namen «Syrien» gehandelte Gebiet war wohl kaum je etwas wie eine «Nation» und das Völker- und Religionengemisch hat in diesem Teil der Welt Tradition. Man darf vielleicht daran erinnern, dass der neben der Omayadenmoschee begrabene Sala-ed-Din kurdischen Ursprungs war und immerhin die Franken und anderen Christen aus Jerusalem getrieben hat. Neu ist eigentlich bloss der Ölreichtum der Golfstaaten und das geschichtliche Unverständnis der Amerikaner. So ist es ja schon beinahe tröstlich zu sehen, wenn ein Holländer auf die kulturellen und historischen Inkompatibilitäten in der Gegend hinweist und dabei offen lässt, dass dieses Terrain bestens für internationale Anarchisten wie Trum und Fabius geeignet ist, durch inakzeptable Forderungen das Waffengeschäft am köcheln zu halten.